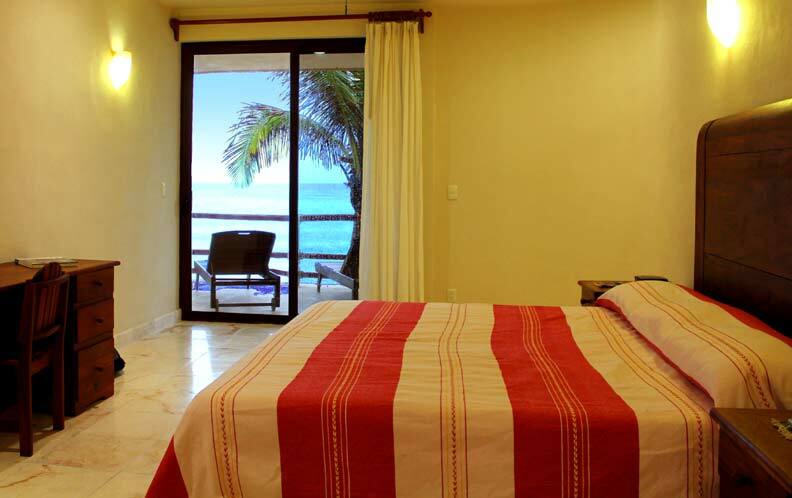 These Costa Maya Villa Condominiums are the first luxury Condominiums available in Mahahual. 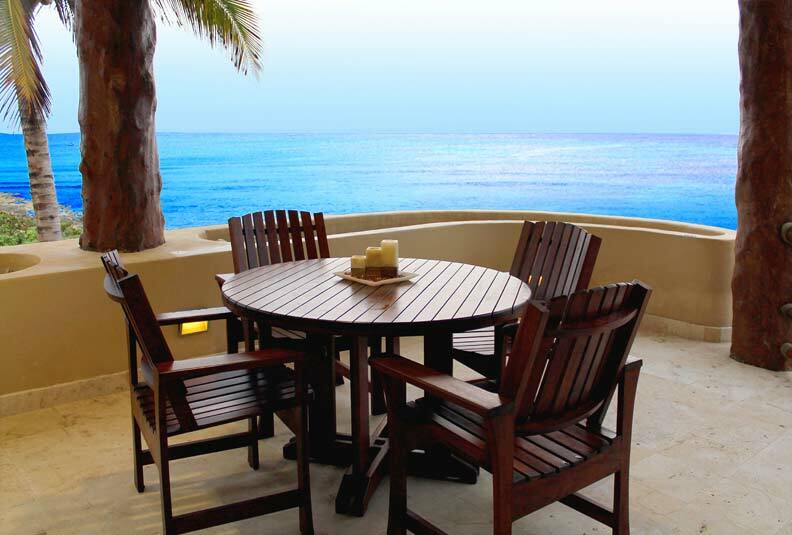 Each privately owned unit has an unobstructed view of the sea with private patios and stunning vistas. We know you will enjoy your stay. Entertainment:Varies, please check when reserving. Caretaker: The units have 24 hour on-site caretakers and maintenance. 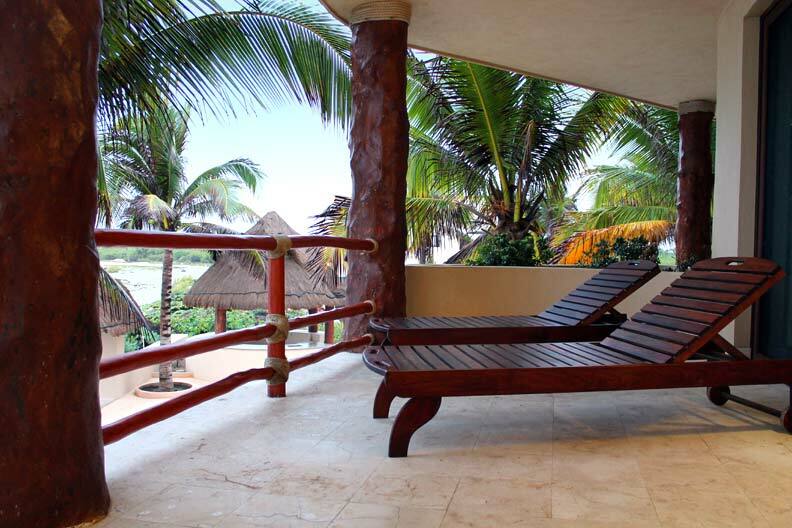 Renting a Condo on the Costa Maya is all about the Caribbean and the beautiful color of the water. Enjoy every meal with this view. In Units #101 and #102, you can watch the cruise ships docking from your dining table. 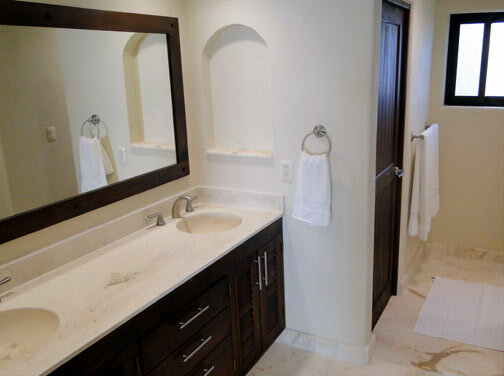 Travertine marble floor tile and shower walls supply a warm and inviting elegance to the bathrooms. Solid wood cabinetry and doors are made of local hardwood. There are two bathrooms in each Villa, each with marble shower and private toilet. This Kitchen is unit #403, but all are similarly laid out and equipped for carefree vacations. The location of Costa Maya Condominiums couldn't be better, situated on a quiet stretch of beach between the Costa Maya Pier and the Lighthouse, it has scenic views of each. Watch the ships dock in the Morning in privacy and local spear fishermen preparing to enter the water in the sandy bay South of the Condos. No other Mahahual location allows this. 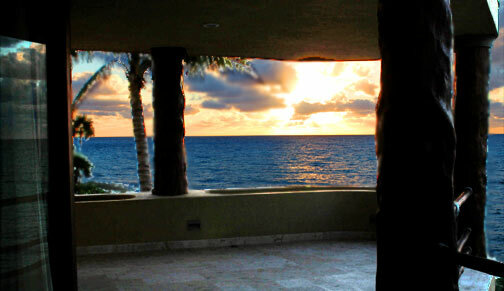 The view of the sea in front of the Condominiums is a stunning blue color, unparalleled in the Caribbean. Watch the morning sun light up the small tourist town of Mahahual and its famous light house (El Faro) from your private deck. The town is a 10 minute walk along the a beach road where there are small "tiendas" where you can purchase food, fresh fish and supplies for your Villa. Mahahual has several nice beachfront restaurants and bars that line the Malecon (Pedestrian walkway). All units have two deck loungers for enjoying the view of the caribbean. Each deck is very large extending from the living room/kitchen and wrapping around to the bedroom. All units have a great view of the Caribbean. This is from unit #102. 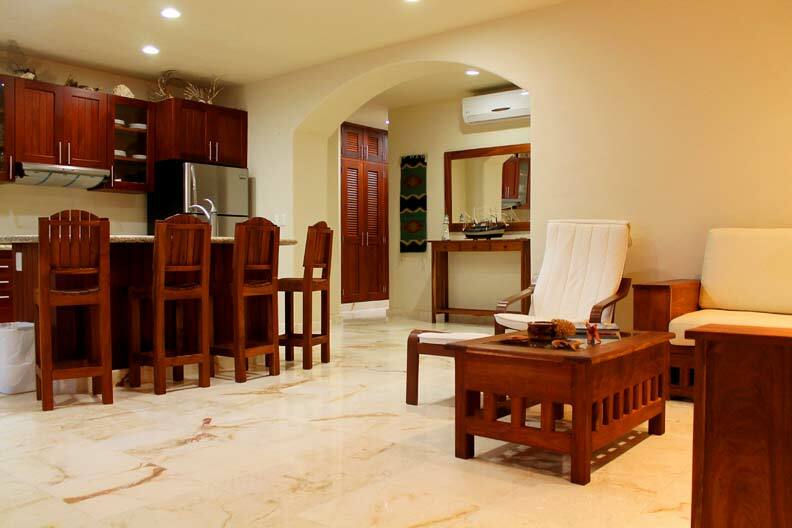 Costa Maya Villas requires a $200 security deposit that will be refunded 15 days after your departure. Please email info@mayanbeachgarden.com about renting . Some condos are dog friendly. Only Jungle separates The condominiums from the cruise ship pier. 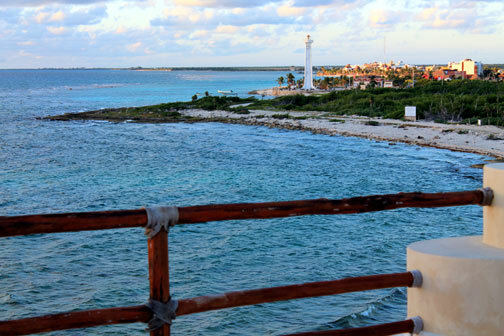 This image of the Oasis was taken from the rooftop of Costa Maya Pier. 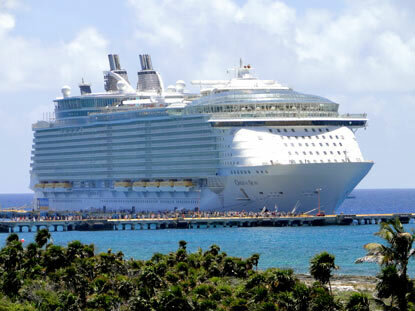 At night, the ships are lit up like Christmas trees and you will have the enjoyment of watching the ships come and go from the best view on the coast. The living room couch is large enough to sleep one extra adult. 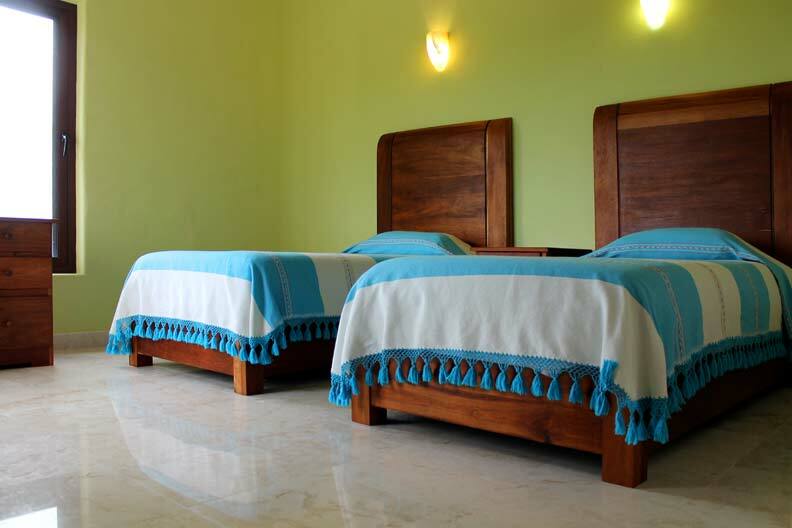 In most Condos the Junior Suite has two single beds with furniture of local Tzalam hardwood. The room includes a private patio accessed by a screen door. 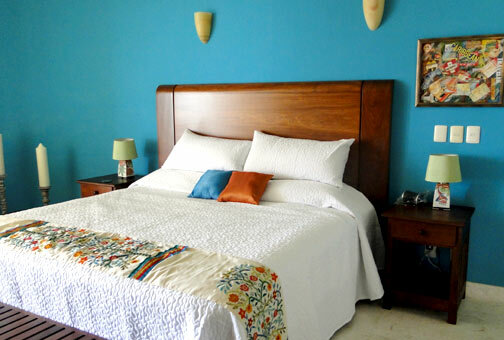 For those who like a little color in their vacation, Costa Maya Villas #101 offers this Mexican decorated Master Bedroom. (note: All units have the same layout but are individually furnished and decorated) All units have king size beds in the Master Bedroom. Sunrise from the large deck of Unit #102 - (second floor). All units have unobstructed views of the Caribbean with large decks, two lounge chairs, table and 4 chairs for outside dining. The decks are so arranged that you cannot see the neighboring decks. The Junior suite in unit 101 has a beautifully decorated queen sized bed. 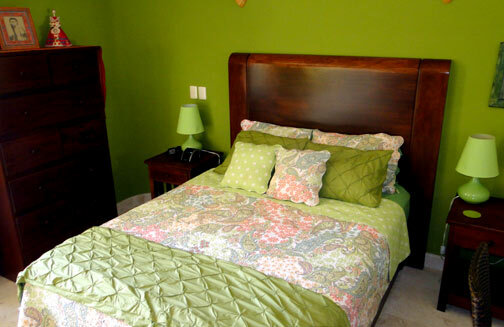 This condo is located at pool level and closest to the Caribbean. A minimum 50% deposit is required to secure a reservation. The remaining 50% is due 30 days prior to your arrival. If reservation is made less than 30 days before arrival, 100% is required at the time reservation is made. Special Holiday Season instructions: If booking during the High Holiday season (Dec. 20 - Jan. 5th) 100% prepayment is required 90 days before arrival. If reservation is made less than 90 days before arrival date, 100% is due at the time reservation is made. 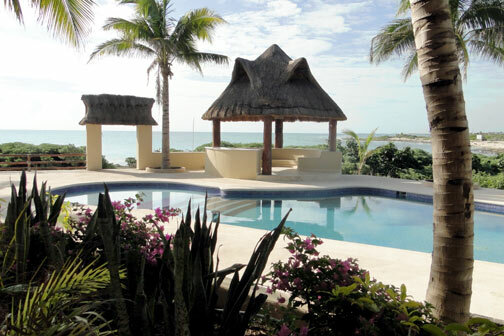 There are several methods to secure your reservation via Mayan Beach Garden Booking. (contact us for the address and to put a temporary hold on Your Condo). Bank Transfer. If this is the method you choose to use, we can provide bank wiring instructions in Mexico or in the United States. Once you have confirmed your reservation with us, we will hold the reservation for 7 days awaiting payment. NOTE: we do not have Mexican phone coverage at our office due to poor service in Mahahual. * E-mail us at Mayan Beach Garden Reservations. You may cancel your reservation and receive a refund less a $200 non refundable booking fee under the following conditions. TRAVEL INSURANCE- FOR YOUR PROTECTION! We urge you to take out adequate insurance coverage to protect your vacation investment against cancellation due to illness, flight cancellations, etc. In the event of becoming ill during your vacation, or having to cut your vacation short, all hospital and medical expenses are your responsibility and you shall not be entitled to any refund either total or partial. Costa Maya Villas and its employees are not responsible for, or liable for any claims, losses, damages, costs, expenses, delays or loss of enjoyment, of any nature or kind whatsoever resulting from events beyond Costa Maya Villa or a supplier's reasonable control, including but not limited to acts of God, flight cancellations or changes, strikes, labor disputes, lockouts, threats or acts of terrorism, acts of war or declared war, hurricanes or other weather conditions. There are no refunds due to bad weather or hurricanes; including any inconvenience or complication caused by a hurricane's direct hit, near miss, or significant threat of a hurricane strike. Hurricanes are by nature unpredictable and an act of God. Clients are encouraged to purchase travel insurance to protect their vacation investment.